Set contains 2 handgrip pads and 2 underarm pads. Provides comfort, style, durability, protection and easy care. One size fits all standard crutches. Made from the finest materials that are resistant to body oils and perspiration. Padding has a high-tech contoured design that is body weight sensitive to provide superior support and extra comfort. 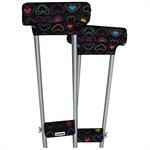 Underarm and handgrip Pads easily slip on conventional underarm crutches and attach with hook and loop for instant fit. Handgrip Pads are reversible for dual wear. Machine wash, cold water, line dry. Made in USA of domestic padding and imported fabric.